The Bluestack Explorer Tour is an opportunity to experience the local culture, heritage and people of Donegal against the backdrop of our spectacular coastline. Travelling through Barnesmore Gap to Donegal Town and Killybegs, there is an opportunity to immerse yourself in history, enjoy bustling local towns, and enjoy mesmerising coastal and mountainous views. To cap it all off, we only visit one of the signature discovery points on the Wild Atlantic Way, Sliabh Liag. 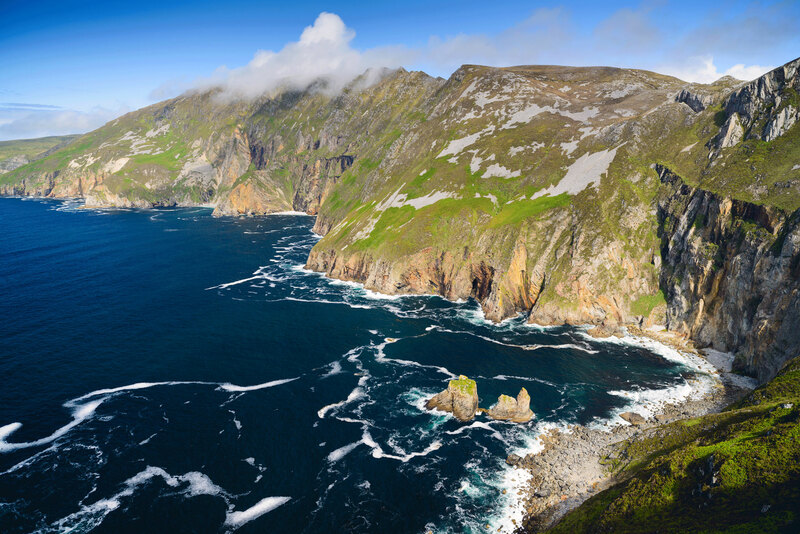 These accessible sea cliffs rise to over 600 metres with dramatic views across Donegal Bay. Donegal Town - The name Donegal comes from the Irish "Dhun na nGall", translated as Fort of the Foreigner derived from the Viking occupation of the town in the 8th Century. Donegal Town is now a busy tourist and market town built outwards from ‘The Diamond’, where the famous Donegal Tweed retailer, Magee (1866) is located. Donegal Castle - Just off the Diamond is Donegal Castle, built by Red Hugh O’Donnell in 1474. Red Hugh was principal of the great royal family, who ruled the Kingdom of Tir Conaill (Donegal) from 1200 until 1601. It was built on a bend on the River Eske for defensive reasons, the river protecting it on two sides. The site may have been used for a Viking fort in the 9th and 10th centuries. After the Flight of the Earls in 1607, the castle and grounds were granted to an English Captain Basil Brooke, who rebuilt and added a floor to the partially destroyed keep as well as adding the Jacobean-style manor house wing. It later fell into ruin in the 18th century. In 1898 the then owner, the Earl of Arran, donated the castle to the Office of Public Works. Killybegs - Killybegs in Gaelic (Irish) is ‘Na Cealla Beaga’, meaning ’small cells’ which refers to the small cells built by monks who once lived in the area. The town is the largest fishing port in Ireland with a deep natural harbour that now accommodates cruise ships from all over the world. Sliabh Liag - A tour highlight is the visit to some of the highest and most spectacular sea cliffs in Europe at Sliabh Liag. A Wild Atlantic Way signature discovery point, Sliabh Liag cliffs rise some 601 metres above sea level, the viewing points provide breath-taking views of the powerful Atlantic Ocean crashing against the cliff face and panoramas across Donegal Bay to the Sligo mountains. Glengesh Pass - A wild and picturesque mountain pass, Glengesh Pass is a high pass between Glencolumbcille and Ardara with an elevated window on Loughros Beg Bay, exquisitely framed between the steep sided Glengesh and Mulmosog mountains. Glengesh (Glen of the Swans) is one of two glaciated valleys that sculpture the northern edge of the Banagh peninsula.